This isn't the post I intended to write today. For the past week, I've been on an even bigger than usual baseball high. Hall of Fame weekend in Cooperstown! What a treat it was, soaking in every bit of Braves glory in a place that honors the saints (and sinners) of our game. I was in absolute heaven! But that post can wait. In less that a week Braves Country went from the highest of highs to the deepest sense of sadness and loss. We lost a legend. We lost The Professor. Our Professor. Our Pete Van Wieren. In a day where the trend is moving toward non-partisans calling the ball game, the most beloved and revered broadcasters are still those who are 'homers'. Every true-blue fan believes their broadcasters are the best. But in Atlanta, it was true. 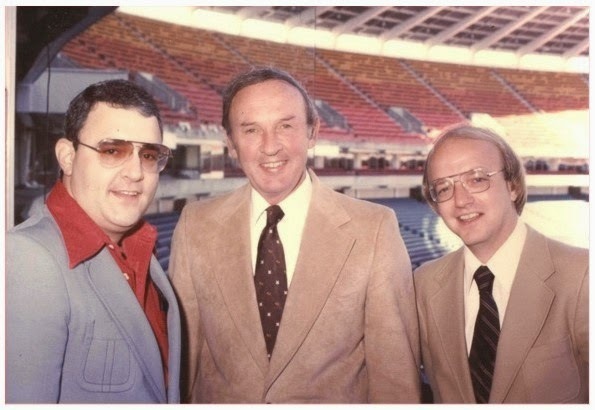 We had the perfect trifecta that brought Braves games into homes from sea to shining sea. Ernie, Skip and Pete. They didn't need last names. There were none better. Three very different men with an amazing chemistry. One a father figure, one a wise-cracking Eddie Haskel and the third, a baseball scholar. As one would say, they covered all the bases. They were perfection in the booth. 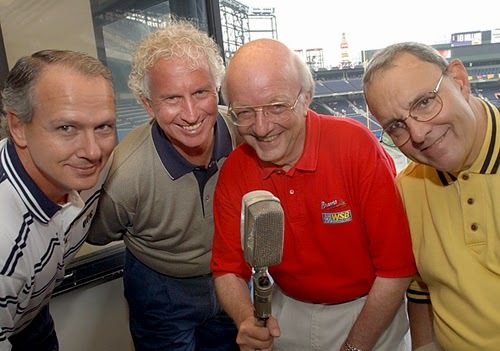 Pete broadcast Braves games from the beginning of the 1976 season until his retirement in 2008. His decision to retire was prompted by the passing of Skip Caray. Pete was reminded that life is short and he had spent an unimaginable amount of time away from his family due to baseball. It was time to focus on what was most important to him. His family. It wasn't easy in the early days. From 1976 through 1990 the Braves posted the second lowest winning percentage in baseball. Yet, due to Channel 17 and then TBS, they were the most watched team in baseball. America's Team. For the Dallas Cowboys, it's a nickname. For the Atlanta Braves, it's the truth. In those days, the Braves broadcasts couldn't have been easy. The lean years were filled with hundreds of lost games and hundreds more empty seats. Sure there were splashes of excitement. Dale Murphy, the 1982 season, Gene Garber ending Pete Rose's hitting streak and Ted Turner in general. Still, it was a tough job. Pete Van Wieren did his homework and came to the ball park prepared. He filled Braves games with facts and figures that were fascinating! He did copious amounts of research before every game. Yet, during the games it never came across as if we were being 'schooled'. Pete used all that information to show us the magic of baseball! Dave Baker put it best when he said "Pete was baseball reference.com before there was an internet." So true! There was nothing that Pete didn't know. As hard as as his first 15 seasons in Atlanta were, the next 17 were spectacular! From 1991 through 2008, the Braves posted the highest winning percentage in all of baseball. As much as the organization and the fans deserved some winning, so did those gentlemen in the booth. There was nothing better than hearing the excitement and pride in the beautiful tones of Pete voice, celebrating Chipper Jones' 2000th hit and John Smoltz's 200th win. Pete voice transported us from our living rooms to Fulton County Stadium and later Turner Field. Pete Van Wieren called 15 division winning seasons, 128 playoff games, 4 MVPs, 6 Cy Youngs, 3 Rookies of the Year (should've been 4 according to Joe Simpson!) and 6 Hall of Famers. Last night's Braves broadcast was filled with beautiful tributes. From the current broadcast team to John Schuerholz, Tom Glavine, Terry Pendleton, Mark Lemke, Jeff Francoeur, John Smoltz, Chipper Jones, Ernie Johnson Jr. and Bobby Cox, the same words continued to be repeated. Gentleman. Class. Family Man. Professional. Prepared. Storyteller. The common thread from the players is that they all felt as if they already knew Pete when they came up to the bigs. After all, they had been listening to him since they were kids. The pitchers spoke of listening to Pete in the club house as they charted pitches. Both Joe Simpson and Ernie Johnson Jr. said that no one out prepared The Professor before a game. Chipper said he loved sitting near Pete on the charter flights so that he could listen to his stores. John Schuerholz said that Pete Van Weiren was a class gentleman and represented the Braves in high fashion. For me, the most moving tribute came from Don Sutton, his voice cracking as he spoke of his long-time colleague and dear friend. He spoke of how much he owed Pete. He said that Pete Van Weiren taught him more about broadcasting than anyone else in the business. "Pete didn't care about being famous. He cared about being good." He went on to say that Pete was the "most unselfish man I've ever been around." "I wonder if I told him enough how important he was to me." The last time I saw Pete Van Weiren was on Opening Day. He was hosting the Braves tribute to Hank Aaron. As fans, we knew Pete would be there. If there was a Braves ceremony, the Professor, our Braves historian, would be our host. Pete was wonderful and he looked so well. It's so hard to fathom that we won't see him again or hear that beautiful voice. As they played clips of some Pete's calls last night, I caught myself smiling. Pete had that effect on everyone. On the day before the sixth anniversary of his father's passing, Chip Caray made all of Braves Country smile when he said, " I can only imagine the production meeting up in heaven tonight." 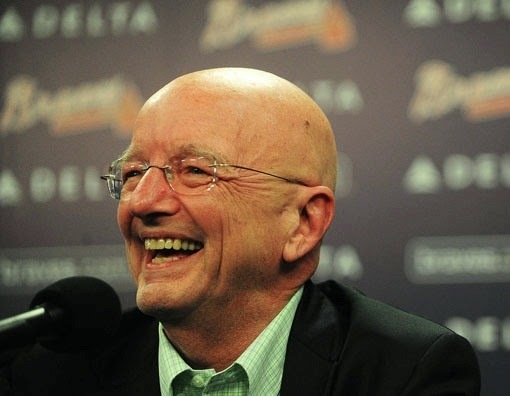 From everyone in Braves Country, thank you Pete Van Wieren. We were lucky to have you and we will never, ever forget you.